The Leaning Bookcase is an ornamental way to display your fine china and decorative plates and glasses. 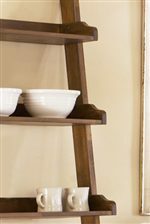 Leaning side supports are attached to shapely shelves for storing and displaying dinnerware. 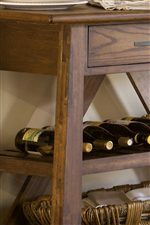 Casual country is a comfortable way to decorate your home and store your goods, especially with a weathered oak finish to give your dining room or kitchen a timeless worn look. 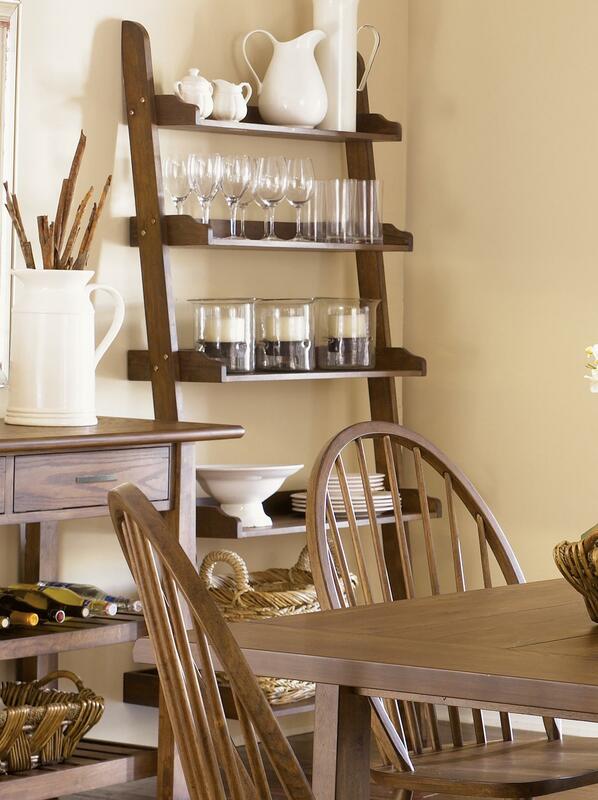 Add the leaning book case to your kitchen and dining area for a simple and decorative flare. The Farmhouse Open Leaning Bookcase by Liberty Furniture at Prime Brothers Furniture in the Bay City, Saginaw, Midland, Michigan area. Product availability may vary. Contact us for the most current availability on this product. Finish Crafted from select hardwoods and pin knotty oak veneers in weathered oak finish. Sophisticated and high-end quality finishes available with a reputation for strong competitive advantages, distinctive appeal, and a high level of perceived value. Finish & Paint Options Crafted from select hardwoods and pin knotty oak veneers in weathered oak finish. Sophisticated and high-end quality finishes available with a reputation for strong competitive advantages, distinctive appeal, and a high level of perceived value. Handles & Hardware Pewter pull hardware. Case Detail Edges are rounded and smoothed, some legs are squared and others doweled. Storage Five shelves to storage or decorative use. Drawer / Shelf Construction All wood dovetail drawer construction; dust proofing; screwed flush mounted back panels; and desirable wood selections are just a few of the exciting features. Construction: Case Crafted from select hardwoods and pin knotty oak veneers. Description: Top Furniture tops are constructed from select hardwoods and pin knotty oak veneers in a weathered oak finish. 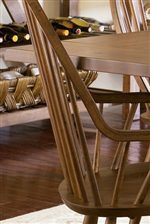 Keep dinner casual and inviting with the sought after weathered oak finish in The Farmhouse Collection. Timeless pieces like the Windsor back chair and server in such a relaxed finish keep family dinners the way they should be, informal and fun. Drawers are fixed with pewter handle pulls and tabletops and shelves are smoothed and rounded for a simple look. Graciously scaled drawers and shelves offer storage and decorative space for your dinnerware. Your kitchen or dining room will welcome family and friends with open arms when you decorate it with The Farmhouse Collection's tranquil furniture. The Farmhouse collection is a great option if you are looking for Casual furniture in the Bay City, Saginaw, Midland, Michigan area. Browse other items in the Farmhouse collection from Prime Brothers Furniture in the Bay City, Saginaw, Midland, Michigan area.